Panel is a window displaying all available undo and redo steps in active document and all the saved versions. 1 Versions list - versions contain saved states with a thumbnail of page or spread. Double click opens the version state, Alt+double click opens the version in a new document. The process of undoing beyond current session version will always result in opening the version in a new document. 2 List of actions you can undo. To undo click on the desired row. 4 List of actions you can redo. To redo click on the desired row. 5 Create a new document containing current document in selected state. 7 Delete this and all further steps / delete version. Depends on which item is selected. 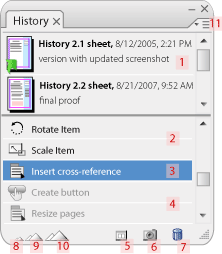 To show History panel in the workspace go to Window menu in Adobe InDesign and choose History.